With the new Hokuriku Shinkansen (bullet train), Kanazawa is an easy 2.5-hour direct train ride from Tokyo. And with the Thunderbird Express, it’s an easy 2-hour direct train ride from Kyoto. Read on for all the details. The train is best way between the main cities of Honshu (Japan’s main island) and Kanazawa. Here are the most important facts. The Japan Rail Pass covers all these routes. It’s also possible to fly from Tokyo’s Haneda Airport to Komatsu Airport (near Kanazawa) but the whole trip actually takes longer than going by train. Kanazawa is about 300km/180mi northwest of Tokyo and about 190km/118mi northeast of Kyoto. The best way to Kanazawa from Tokyo, Kyoto, Nagoya, Osaka and most other cities on Honshu (Japan’s main island) is by train. With the opening of the Hokuriku Shinkansen in 2015, it’s now become very easy to travel direct from Tokyo to Kanazawa and then head south from Kanazawa to Kyoto, making a great three-city loop of Japan. Here are the details. The best way between Tokyo and Kanazawa is by train. The Hokuriku Shinkansen (bullet train) started service in 2015. It connects Tokyo Station and Kanazawa Station. The fastest trains, called Kagayuki, do the trip in 2.5 hours. The fare between Tokyo and Kanazawa is Y14,120. In Tokyo, you can board the Hokuriku Shinkansen at Tokyo Station (recommended if you have an unreserved ticket so you can get a seat) or Ueno Station. In Kanazawa, the trains start and stop at JR Kanazawa Station. You can use the Japan Rail Pass on this line. Trains are the best way to travel between Kyoto and Kanazawa. Limited express (tokkyu) trains called Thunderbird travel between Kyoto and Kanazawa in about 2 hours and 10 minutes (some trains take slightly longer). The fare is Y6,380. In Osaka, these operate from JR Kyoto Station. In Kanazawa, these trains operate from JR Kanazawa Station. You can use the Japan Rail pass on these trains. Trains are the best way to travel between Osaka and Kanazawa. 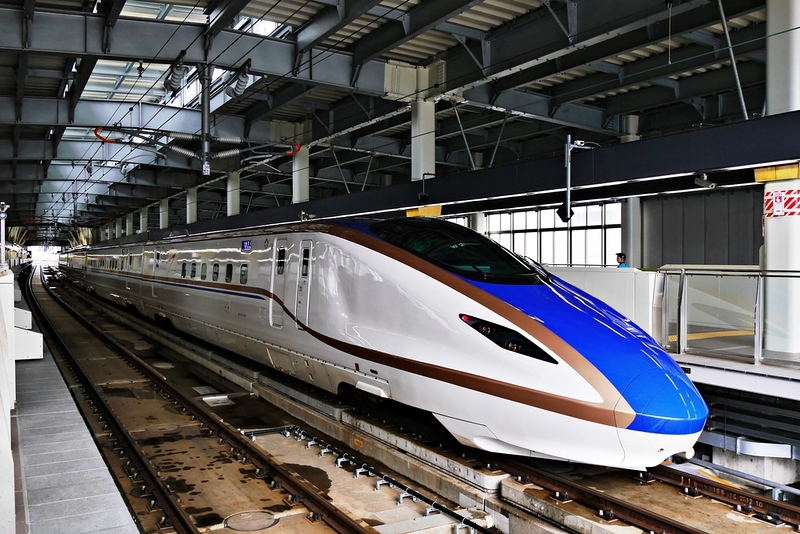 Limited express (tokkyu) trains called Thunderbird travel between Osaka and Kanazawa in about 2 hours and 38 minutes (some trains take slightly longer). In Osaka, you can board these trains at JR Osaka Station or JR Shin-Osaka Station. In Kanazawa, these trains operate from JR Kanazawa Station. You can use the Japan Rail pass on these trains. It’s possible to fly between Tokyo and Kanazawa by plane, but it actually takes longer and costs more. JAL and ANA have about 10 flights a day between Tokyo’s Haneda Airport and Komatsu Airport, which is close to Kanazawa. There are airport shuttle buses between Kanazawa Airport and Kanazawa city that take about 40 minutes and cost Y1,130. The flight itself costs around Y24,890 and takes about an hour. But the whole trip, including airport transfers takes almost 3 hours and costs around Y26,670. Thus, the train is a much better choice. The cheapest way to travel between Tokyo and Kanazawa is by bus. Willer Express offers buses between Tokyo and Kanazawa. They cost between Y5,100 and Y9,300 and take between 7.5 and 8.5 hours.